The most powerful, User friendly system on the market BAR NONE! 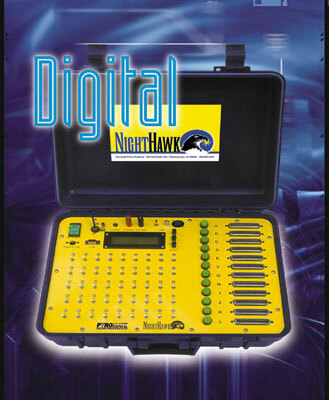 The Digital NightHawk is the Flagship of the pyrotechnic industry, it has more features, flexibility, firing modes and show memory capacity than all other systems combined. It has all the features of the NightHawk with the added capability and flexibility of Digital operation. The Digital P-45 Firing System is the Little Brother of the Digital Nighthawk the Flagship of the pyrotechnics industry, It is designed for manual fire without all the bells and whistles of its big brother. It boasts cutting edge technology and features that are unavailable on any other firing system made by any company and is Compatible with all Digital Pyromate modules including Digital Wireless. Digital P-45 AF DOWNLOADABLE AUTOMATED VERSION With FSK TIME CODE !!! The Digital P-45 Firing System is the Little Brother of the Digital Nighthawk the Flagship of the pyrotechnics industry, It is designed for Automated fire with all the bells and whistles of its big brother. It boasts cutting edge technology and features that are unavailable on any other firing system made by any company and is Compatible with all Digital Pyromate modules including wireless. Advanced computerized firing system with full pyromusical time code support. System is available in a Digital wireless, wired, or hybrid configuration. Advanced computerized firing system with full Time code Transmission brought to new Standard, Advanced Spread spectrum technology with 5 mile range and ease of use simplifies time code driven shows. Manual 16-cue, wireless remote firing systems with 1500' range. Receivers can be setup to fire individually or simultaneously in unlimited quantities. Industrial strength manual, analog firing system with expandability to 540 cues offering a durable, inexpensive alternative for large shows. Manual, analog firing system for small shows up to 96 cues, featuring an internal power source. Firing system uses capacitive discharge to shoot up to hundreds of cues in series at the same time. It comes in single shot, 12-shot, and remote 12-shot configurations. All variations have internal power source. DISCLAIMER: The purpose of this equipment is to cause initiation of industry standard Pyrotechnic electric matches to ignite display type fireworks or pyrotechnic special effects. Fireworks and special effects materials are explosives and may cause personal injuries or death to yourself or others, including spectators. SAFETY IS YOUR RESPONSIBILITY and is beyond the control of PYROMATE Inc. The buyer / user assumes all responsibility and liability in the use of this equipment and further agrees, by purchase and /or use of this equipment, to indemnify and hold harmless PYROMATE Inc. and its agents against all liability for injury, loss, or damage direct or consequential arising out of the use of, or inability to use this equipment. Any subsequent purchaser is also bound by these conditions of sale. There is no 30 day trial period as printed in previous ads or Flyers. Prices are subject to change without notice. Terms, 1-All Systems are built to order and require a non refundable 20% down payment and Cancellation of said orders are subject to a 20% restocking fee. There will be a 4% Fee on credit or debit card orders. 3- All delinquent payments will be subject to Finance charges of 2% monthly. 4- Anyone purchasing equipment from Pyromate is bound by these terms.